Are you ready to hit as hard as a Norse God? In honor of a certain unnamed super hero movie releasing this weekend we will be launching the Sky God set. This electric set comes with a new armor, weapon (Sky Hammer), and a brand new power... LIGHTNING! That’s right; you now get to call down the destructive force straight from the sky. 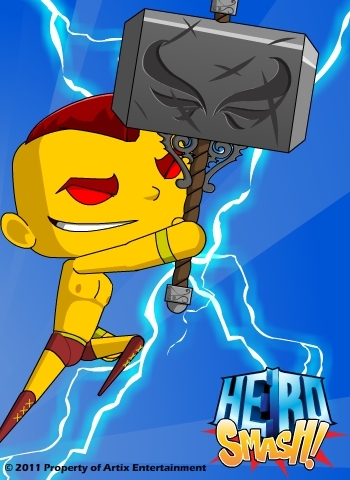 The energy element is making its way to Hero Smash with Lightning Strike and Thunderous Rage. Check it out! Keraunophobics be warned. Where do you get all these awesome powers and gear? Well, I'm sure Spear will tell you. We did announce he won right? We didn't? Um... Hmmm. Is my face red (which makes it more of an orange-ish color) HA! Well now you know! Spear is our newest Player NPC selected from his impressive “Who Want's to be an NPC” submission. Tomorrow (Friday) you can go looking for Spear, and you can get the Sky God items from him. I got a message from Dummose today. He asked me to tell you the exterminators were working feverishly to rid Super City of as many bugs as possible. You may want to wear your Red Soldier Helms to avoid inhaling those harsh but squashing fumes.